What a name– the Last House?! This enchanting villa is so named (only in Ceylon!) as it is the famous Geoffrey Bawa‘s last architectural masterpiece, if not his grandest. The Last House is located on the south coastline near Tangalle, a long six hour drive from Colombo– so we do recommend you break up the journey on your way. The villa is positioned on an idyllic strip of land with a lagoon on one side and long white sand beach on the other. 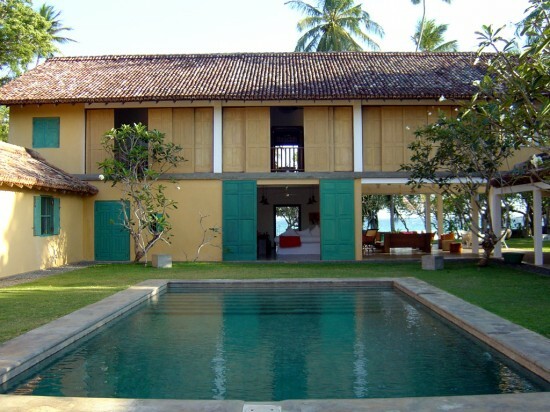 Geoffrey Bawa perhaps needs no introduction to those are familiar with Sri Lankan cultural history, renowned for his mix of eclectic and modern architectural styles. The layout of this, his last project, is shaped like a horse-shoe, with kitchen, living rooms and courtyard bedrooms surrounding the idyllic swimming pool on three sides. The advantage of this design is that while the various verandas, dining and sitting rooms are well-suited to social occasions, the property also offers privacy to friends or generations of a family. At the back of the main building there is a lovingly-tended garden with an expansive stretch of lawn leading down to the beach. There are four double bedrooms with en suite bathrooms, as well as a twin and a single that share a bathroom. Bedrooms are beautifully furnished, airy and light. The rooms can comfortably accommodate up to 11 guests. Master Bedroom: situated on the upper floor with a balcony overlooking the pool and the sea beyond, this is an exquisite suite furnished with a king size bed. The ensuite bathroom has a Victorian bathtub and shower. Family Room: Located upstairs and has twin beds with an attached second room with both sharing one bathroom. Turquoise Room: Located on the ground floor opening out to the gardens and the sea beyond, this is a spacious room with a private garden and ensuite bathroom. The room is furnished with a king size bed. White Room: Situated on the ground floor next to the Turquoise room, this also has sea views and a private garden. The living and dining areas overlook the 10-meter swimming pool. The interiors are tastefully designed with a mix of antiques and contemporary furniture, local art and artifacts. The many courtyards, verandas and balconies offer much privacy and many secluded spaces for guests to relax in. Local rice and curries and western dishes are served according to guest’s wishes in the gardens, the main dining room or in your own private courtyard or balcony. There is a full complement of staff, including an excellent chef. Unlike most villas, the Last House is sold on an “all-inclusive” basis with a per person fee charged each day for three meals and all your beverages, including house wine 😉 Prices come in at around $1,000 per night for the whole villa and in this case we recommend booking directly with the villa.